_ The field of Expressive Arts Therapy (EXA) was founded in the early 1970’s by Shaun McNiff, Paolo Knill and others at Lesley College Graduate School in Cambridge, MA. It emphasized an interdisciplinary or “intermodal” approach to the use of the arts for healing, in contrast to the specialized arts therapies, which at the time restricted practice to one artistic discipline and usually were based on an established psychological framework. _ As Expressive Arts Therapy developed, its theoretical basis became more clear. Paolo Knill developed the theory of intermodality, in which he clarified the use of the different sensory modalities and artistic disciplines in therapeutic practice. In order to facilitate the full range of clients’ expressive possibilities, the therapist must herself be comfortable with a multiplicity of modes of artistic expression. This does not mean that she must become a professional in all the arts; rather, we speak of a “low-skill, high-sensitivity” approach: therapists must cultivate their sensitivity to all modes of expression without necessarily becoming experts in each of them. CREATE graduates can get credit at EGS for their training at The Create Isntitute, and receive masters degrees by attending three summer schools in Switzerland and writing a masters thesis. The CREATE Institute is also part of the International Network of Training Centres in Expressive Arts Therapy. 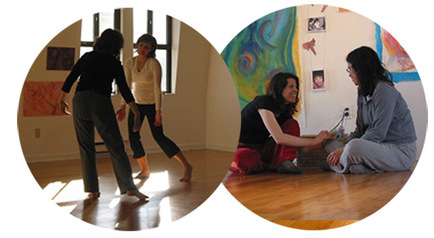 CREATE has trained expressive arts therapists in Toronto for over twenty years. Our graduates have gone on to work in agencies and clinics, as well as in private practice. In the spirit of Expressive Arts Therapy, we like to think that the training has helped ISIS graduates to shape themselves in accordance with their own possibilities of development. _ Becoming a therapist is itself a creative process that requires the use of all our capacities and an ability to decenter from the literal world in which we live, in order to be able to enter freely into the alternative world of the imagination and make it a home for ourselves. Only then can we find the resources we have to meet the needs of our clients. The ability to play with others with high sensitivity to their particular way of being in the world is key. At CREATE Institute we hope that students will acquire not only the skills that they need but also the self-development that is necessary to become a good therapist. Through the combination of class-work, readings, practicum experience, studio work and personal therapy, students go through an intensive educational process that can provide a solid basis for therapeutic work. We are proud of the school we have shaped in Toronto, and we intend to continue and develop in new ways that will both work for ourselves and fit our changing world.